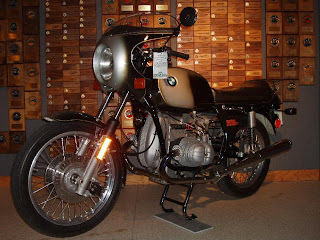 At the time, I believe the 1975 BMW R90S was marketed as a "Superbike", i.e. a large displacement road-burner. However, in retrospect it may have been one of the earliest incarnations of what would later be known as a "sport touring" bike: a machine designed to cover long distances quickly and in relative comfort, particularly if the route between Point A and B was as twisty as possible. Here is a good summary of the R90S' specifications. I shot the pic at right (click to enlarge) at the AMA Museum in Pickerington, Ohio last Summer. Nice 75 bmw r90s - an early sport-tourer post! Thanks for intesting info!